This article is about secrets in the games. For other uses of egg, see Egg (disambiguation). Easter eggs are specially hidden secrets that have been put inside the games on purpose. Normally, these do not affect gameplay and are just for entertainment. This page will also include smaller secrets that do not exactly qualify as Easter eggs. At times, references to other series are considered Easter eggs as well, but those will not be presented on this page for the sake of organization, and will instead be listed here. "Fireworks" redirects here. For the fireworks cone treasure, see Boom Cone. A commonly recognized bonus. When / is held down, Olimar will lie down on the floor. Nearby Pikmin will then pick him up, and take him to one of the Onions. When he's sucked in, he will hit the bottom of the Onion, and a light will appear from the large flower on the vessel. It will rise into the air, and explode into a burst of light, similar to fireworks. Nothing else happens. This was removed in Pikmin 2, but the leaders can still lie down and be carried after obtaining the Napsack. It is possible to wake up while being beamed up, at which point Olimar will still hit the Onion, but no fireworks will come out. A Pikmin going "Whoo!". Same sound as when a Yellow Pikmin discovers a bomb-rock or when a Blue Pikmin saves another Pikmin from drowning. A Pikmin sighing. Same sound as when a Pikmin tries to grab onto an object to carry it, but gives up. A Japanese voice saying an unknown word. The cause for these sounds is unknown, but it seems to happen randomly, despite being rumored that it changes according to the buttons pressed. If the player's leader has Pikmin in his group, and is walking around, there is a high chance the Pikmin will sing or hum something. Ai no Uta: If the current leader has 20 of each of the five main types with him, they will sing the notes for the first line of the theme song that was used in the Japanese commercials for the first game: Ai no Uta. Title theme: If there are no treasures left in the current area or sublevel, the Pikmin will sing the first six notes of the game's leitmotif, played on the title screen. This also happens in Challenge Mode. Simple hum: If there are treasures left in the current area or sublevel, they will sing a simple three-note song. Again, this also happens in Challenge Mode. A Bulborb roaming around in the title screen. / : makes the Pikmin forming the title disperse and reform the letters "PIKMIN 2". This is possible even if "PIKMIN 2" is already spelled out. It also makes the beetle or Bulborb leave, if they're on-screen. / : same as L, but they spell out "Nintendo". Note that there are no White Pikmin or Purple Pikmin in this formation (identifiable by their pink flowers). / : spawns an Iridescent Flint Beetle. The Pikmin will chase after it, but nothing happens to it. / : spawns a Red Bulborb. It will make the Pikmin on the screen run around in panic. It'll bite twice and run away, unless it's manually controlled. / : moves the Beetle/Bulborb forwards. It can't go over the borders of the screen. / : turns the Beetle/Bulborb left/right. / : makes the Bulborb bite. 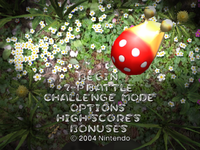 Pikmin eaten will be gone until the title screen is refreshed. The Ujadani are small insects that can only be found on specific days, and specific locations, making them a very rare encounter. They can be found on days 31, 61, and so on, and show up at the Wistful Wild. There are two known places where Totaka's song can play in Pikmin 2. The song is a small jingle hidden by composer Kazumi Totaka himself in some games he's worked on, like Mario Paint. When in the treasure tally screen of a cave, if the player collected all treasures, and thus, has completed the cave, a small jingle will play, a message will appear, and confetti will drop. After waiting in this state for 3 minutes and 50 seconds, Totaka's song will start playing. A video of it can be found here. It should be noted that this does not occur in the New Play Control! version. When the player is about to enter a sublevel in a cave, if the game cannot be saved, a screen will show up warning the player that it could not save, to the tone of some ambient bells. After waiting here for 3 minutes and 45 seconds, Totaka's song will start playing. A video can be seen here. Because the Wii remake does not use memory cards and is always able to save the game, this Easter egg cannot be triggered in that version of Pikmin 2. An example of one of the Pikmin drawings. In certain Pikmin 3 areas, one can find small, well hidden drawings that portray Pikmin. There are ones that show just a Pikmin by itself, and others that show Pikmin near their specialty, such as Red Pikmin near fire, or Rock Pikmin breaking a crystal nodule. Scattered throughout the game are several instances of text written in a language that can only be assumed to be Koppaite. These messages are written in English, and their purpose varies, but are kept a secret to most players, since they are impossible to decode unless the player knows the cypher. Each character in the Koppaite language actually matches up with one or two Latin letters, which is what makes decoding possible. If Alph, Brittany, and Charlie are walking together with no Pikmin, they will begin to sing the motif often played throughout the game, such as when landing in a new area. The lyrics consist entirely of the word "Koppai". If the leaders have 20 of each Pikmin type out and are walking, the Pikmin will start to sing the theme song. If the player has every Pikmin type and has 100 of one type out, the Pikmin will attempt to sing the theme song, but they will sing in discord. If 20 idle Pikmin of one type are left alone for long enough, they will sing along with the area music. Although it is unclear whether this is an Easter egg or a glitch, it is possible to see pellets with colors that are unavailable in the game. They can be seen in certain areas using the KopPad's map panning feature. This page was last edited on January 4, 2019, at 15:37.